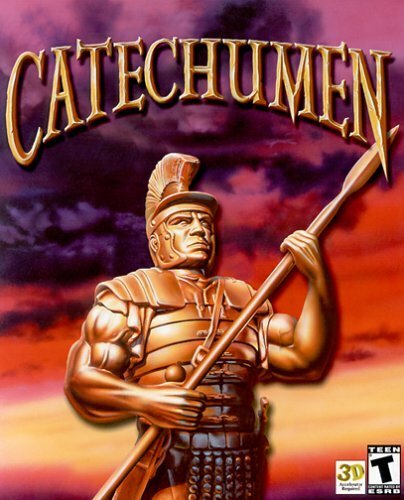 Catechumen’s is a playable Christian computer game about a Christian Catechumen at the time of the Roman Empire who journeys through the catacombs of Rome to rescue his mentor aided by the “Sword of the Spirit.” The gameplay is fairly well done although it needs more emphasis on story and less emphasis on redundant combat. By simply looking at the score this game received, you would not think it anything special. However, Catechumen’s merit lies in its achievement: that a Christian inspired game has managed to achieve playability. The basic story revolves around the idea of the Christian mentor system during the time of the Roman Empire. You are a Catechumen, which is basically an apprentice preparing to become a full-fledged Christian, who learns that your mentor has been captured by the Romans. Unwilling to stand by idly, you decide to journey through the catacombs of Rome to rescue him. Aided by the “Sword of the Spirit,” you blast your way through the legionaries, imps and demons. That being said, an examination of the pros and cons can now be undertaken. First there is the gameplay. It is fairly well done. The crowded corridors make for a rather suspenseful atmosphere, and the sound of Roman guards caused me to glance around using my mouse far more than once. However, being accustomed to secular first-person shooters, when I first “killed” a Roman guard with my “Sword of the Spirit,” it was a comical moment as the man suddenly fell to his knees in prayer. Unexpected, certainly. I was pleased when the little imps that I shot actually disappeared and red mist flared where I had hit them. Of course much of the game is simple “find key, open door” searches. With a little variety among the missions, the game could be much improved. Another aspect of gameplay that should be expanded upon is interaction with other people. While searching through the catacombs for enslaved Christians is certainly noble, it does not lend itself to a populated environment. It would be nice to see a Christian RPG (Role-playing Game) with more emphasis on story and less emphasis on the eventually redundant combat that you experience in Catechumen. Moving on to the second point, the A.I. is lackluster. Roman guards, imps and demons alike reacted the exact same fashion to my movements. First I would rush into a room. Operating, most likely, on a coordinate-based acquisition system, the A.I. would check to see if I had reached a certain distance from the monster(s). If I had, then the A.I. would simply move as close to my character as possible to attack and keep running at me. With the Roman guards this was understandable, as they have to touch you to do damage; however, the imps fire long-range projectiles, so that did not make much sense. Also, there is not even the least attempt by the imps to use cover of any sort to protect themselves. Rather they charge blindly forward, as does everything else in the game, to kill or be killed. The graphics in Catechumen are a pleasant surprise. Backgrounds and environment textures are crisp and clean, which allows hearty sessions of play minus the upset stomach. While human models are cartoonish and lacked details, they are still of superior quality to what little else I’ve seen in the Christian computer game market. However, as a general rule all creature models in the game are blocky to a recognizable point. Though this could be improved considerably, it still does not handicap the game nearly so much as the A.I. Sounds and music are well suited to the environs. Of course, it is not the quality of most secular commercial games. In particular, I enjoyed the Roman guards and their dialogue. As a whole, the game has done its job adequately. It is undoubtedly the best Christian computer game I’ve ever played. It could use a bigger budget for general improvements all around, but the only major complaint I have is its A.I. If you are heavily opposed to non-Christian games, then this game is a must-buy. SUMMARY: Catechumen’s is a playable Christian computer game about a Christian Catechumen at the time of the Roman Empire who journeys through the catacombs of Rome to rescue his mentor aided by the “Sword of the Spirit.” The gameplay is fairly well done although it needs more emphasis on story and less emphasis on redundant combat. (CCC, V) Very strong Christian worldview with mild violence and many redemptive elements. Distributor: N'Lightning Software CONTENT: (CCC, V) Very strong Christian worldview with mild violence, many redemptive elements.